September for most of the western hemisphere means cooler weather and the beginning of the fall season. Here in Las Vegas, September days are often 100 degrees or hotter, and for me that’s still too hot to go outside and play. This is the time that I start to get tired of the heat, and imagine breezy afternoons and cool nights. My kids are also ready to return to their favorite parks and have picnic lunches on the weekends. But from past year experiences, I know it doesn’t cool off enough for that until October. And so indoor activities become that much more important to ease our frustrationds of (still!) being cooped up inside. The kids give Pump It Up two thumbs up. On those hot days, there’s a hidden gem in town that I like to take my kids to – an indoor, inflatable playpark called Pump It Up. 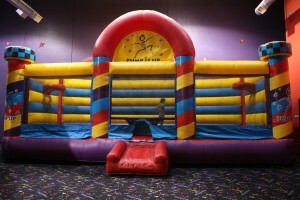 Okay, imagine one of those bounce castles that you see in people’s yards….got the visual? Now move that indoors (hello air conditioning!) and multiply it by ten. Pump It Up is a huge building filled with an enormous blow-up multi-level obstacle course, fast slides and basketball “courts”. 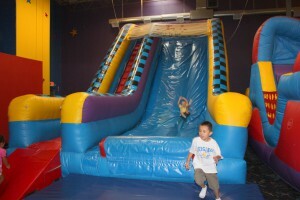 The inflatables offer a bouncy area for almost every age; from barely-walking babies all the way up to adults. Adults! What does this mean for me? It means that I get to jump, too! Ladies- make sure to wear your sports bra because a trip here is as good as a trip to the gym. I’ve been coming here since my six-year-old was just old enough to walk and we’ve always had a good time. One of the three slides. Whee! 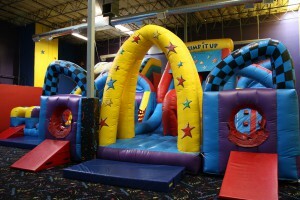 Last week, the kids and I headed to Pump It Up for a 6th birthday party. After we watched a short video about safety (no flips or acrobatics for us!) and had a quick sock check (socks are required for everyone), the party was let loose to jump, bounce and slide until their heart’s content. Fun, family-friendly music played in the background and, for a bit, I sat and relaxed on the benches and gossiped with the other mothers. Once I made sure I was up-to-date on the latest parental news, I slipped my socks on and followed my three-year-old daughter through the inflatable obstacle course – which ended with a 20-foot slide. Whee! Most of the other parents – moms and dads alike – were happily jumping with their kids, too. It’s almost impossible to resist trying it for yourself! I did notice that some of the smaller kids got stuck in the middle of the obstacle course, so my only advice would be to make sure you know the course before letting your little one crawl into an entrance tunnel, or else you might hear them calling for help somewhere inside of it! Been there. That can be quite distressing. After an hour-and-a-half of jump time (which will tire out any active kid), we headed into the private party room for pizza and cake. The birthday boy got to sit in his very own, “king” blow-up chair. The tables were picnic benches which made serving an abundance of kids at once extremely easy – it’s amazing how many kids you can fit onto one bench! Just cram them all in and pass down the plates. Basketball - Pump It Up style. 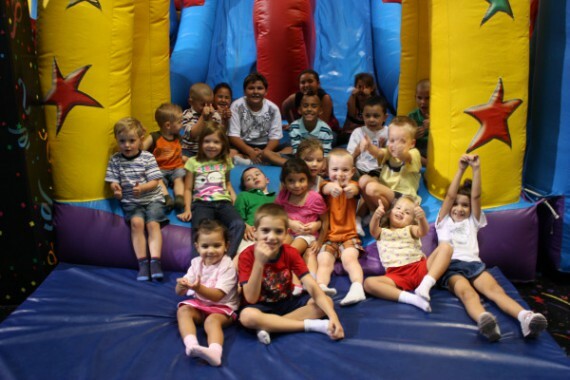 To check out Pump It Up’s hours of operation, directions, birthday party packages and their “pop-in” play times, visit their website. You can also reach them at 1-866-977-JUMP (5867). There are Pump It Ups “popping up” all over the country, so even if you’re not in Las Vegas, you might still find one near you. Wow! This sounds like a great place. I’ll have to go check it out sometime. He said he had the best birthday party ever! there was fun for kids and adults. everyone said their kids went home washed up and fell asleep. I live in Ga so I could not be there, but Jojo described every detail on the phone. Yes, my kids (and I!) had a ball and I’m glad that Joseph decided to invite us!